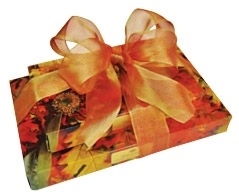 Seasonal, Holiday, and Special Occasion Gift Boxes can be ordered online here. We can help customize your special day or event by making a delicious, personal gift for your guests. 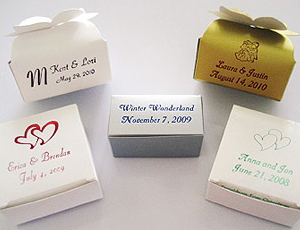 Boxes can be stamped with name(s), event date, or a special message. Monograms are also available! Numerous script and color options allow for our treats to compliment the event. Favor boxes can be filled with any of our homemade chocolates. Most commonly requested are – Buttermints, Caramels, and Butter Creams. Truffles are a popular option, but do come at a slightly higher price. Bow Boxes: ONLY available in a 2-piece size. Flat Boxes: Available in a 2-piece or 4-piece size. We will only accept orders with a MINIMUM of 50 boxes if stamping is to be included. We must be informed of the final head-count, for the event, at LEAST two weeks before the scheduled pick-up of your favors. Create Your Own Wedding/Special Event Mold! We are willing to work with you to design a mold that will make your favors “one of a kind.” By participating in the design, you are creating a truly personalized gift for your guests. PLEASE NOTE: Creating your own mold takes a few drafts before arriving at the final product. Please contact us at LEAST three months in advance if this is an option you want to pursue. There is also a one-time flat fee to have the mold made. This price varies on the mold’s shape and size, so please call us [Toll Free: 1-800-975-7236 or (765) 482-3334] for further pricing options! 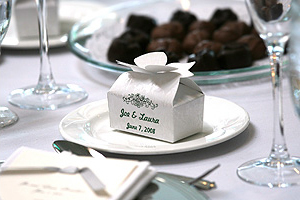 Use Our Wedding/Special Event Molds! We also have wedding molds which would offer a nice compliment to a slice of wedding cake or a tasty decoration on guests’ dinner tables. 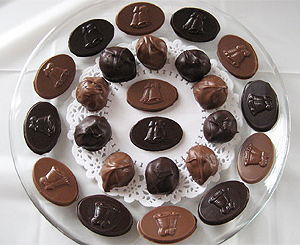 Molds can be filled with either dark or milk chocolate.